The first phase of polling for Lok Sabha elections 2019 is set to take place on Thursday. All political parties are intensely canvassing for the April 11 polls as today is the last day of campaigning for phase 1. 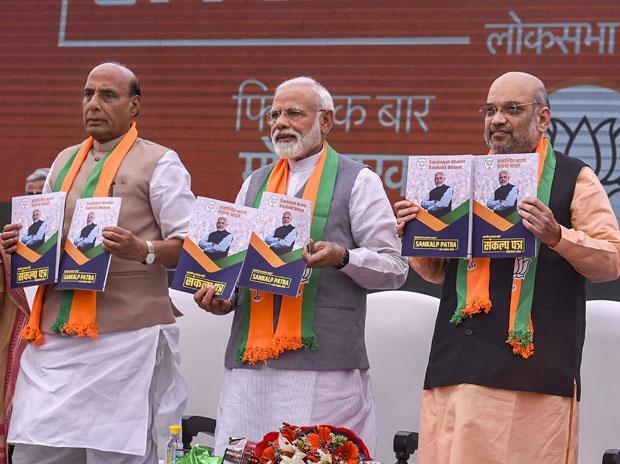 Prime Minister Narendra Modi released the BJP's manifesto in the presence of senior party leaders, including president Amit Shah who said the 'Sankalp Patra' makes 75 pledges and promises to fulfil all expectations of the people. The 'Sankalp Patra' (document of resolution) comes three days before the seven-phased Lok Sabha elections begin on April 11. Congress released its 55-page manifesto last week. The 55-page Indian National Congress manifesto released by party President Rahul Gandhi took one year to put together and covers a vast range of issues from jobs, farmers, national security to even LGBTQ rights. Calling the BJP's manifesto for the upcoming Lok Sabha polls a "vision document", head of the party's manifesto committee Rajnath Singh said the government led by Prime Minister Narendra Modi was fully committed on nationalism and zero tolerance towards terrorism. He said the BJP was committed towards implementing a Uniform Civil Code in the country and all alternative options will be explored for the construction of a Ram temple at Ayodhya in Uttar Pradesh in the most conducive manner. The saffron party would ensure the passage of the Citizenship Amendment Bill in Parliament with utmost respect to every state's cultural values, Singh said. For rural development, the BJP promised to spend Rs 25 lakh crore in the next five years. "Will give Rs 6,000 yearly income support to farmers and pension to small and marginal farmers above 60 years of age," Singh said. Meanwhile, parties will sweat it out today in Uttar Pradesh. BJP and Congress plan to hold mega rallies in several parts of western UP. Yogi Adityanath will address public meeting in Bijnor, Muzaffarnagar, Kairana and Baghpat constituencies, Congress President Rahul Gandhi and party General Secretaries and eastern UP in-charge Priyanka Gandhi and western UP in-charge Jyotiraditya Scindia will hold public meetings in Saharanpur, Shamli and Bijnor.